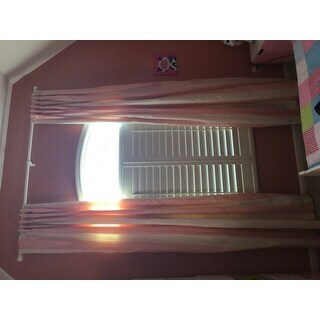 Nice light pink color for my daughter room. I recommend to use only for kids room unless you are pinky girl. I do not like pink but like the color yes. Whimsically styled and colored, this silk taffeta curtain panel features pink and cream stripes that will enhance any decor. The panel is constructed with cotton lining and flannel interlining for thermal insulation that will also block out UV rays. The panel also features a rod-pocket design that makes hanging the panel easy. These curtains are beyond beautiful. Ordered for my daughters room, I was hoping for something chic with a touch of glamour and thats exactly what I received. Capable of blocking the draft from our 130 year old single pane windows, the mere weight of these panels boosts their value. The crisp faux silk taffeta fabric provides an elegance that is fancy enough for the most formal rooms. Ive received nothing but complements on the look and feel that they have added to the room. If youre looking for a high-end look, thats rich in quality but wont completely empty the bank youve found it right here. I am absolutely in LOVE with these curtains! I was looking for something for my new baby girl's nursery and it was a little difficult to find something I love. They are pretty pricey, but I believe you get what you pay for. When I showed them to my mom and said "look they are lined" she said, "no, they are double lined". The fabric is just gorgeous (although I have NO idea how I'm going to get the wrinkles out!) They might not be black out curtains per se, but they definitely suffice for me and I am a huge fan of black out curtains. As for the color, there was a review that said they are more peach than pink. I disagree. I think they are a beautiful color pinky peach. Very similar to ballet point shoes. Not that purple pink color. Whatever the color is exactly, I would have to say it's closest to pink, but just downright gorgeous either way. And the white/cream stripe looks rich against my bright white molding in the room. I haven't put them up in the room yet b/c we are waiting to decorate the nursery until after she arrives, but I am very excited about my new curtains. I'm so glad I had an overstock coupon to use b/c I believe these will make the room really special. I'm glad I splurged a bit and bought these panels for my daughter's room. They make a simple yet big impact because of the beautiful colors and quality made design. I also love the fact that they were easy to hang up and they effectively keep the thermal temps under control due to the insulated lining. I would highly recommend this product and would buy them again if necessary! I looked high and low for silk panel drapes for my daughters room. Please not that i am a very picky customer. I decided to give these a shot knowing that i could always return them, and get custom panels done instead. i am happy to report that these are absolutely beautiful. they drape just like silk and give my 10 year olds room a very polished look. They are as good as custom, for a fraction of the price. If you are concerned about the color, the cream stripe is the same as Benjamin Moores "White Dove" paint. The pink is a very pale peachy pink. 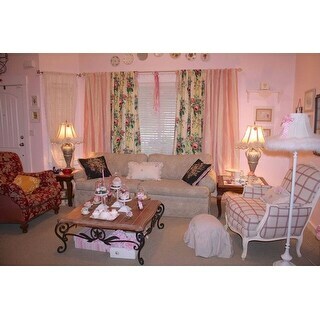 I ordered to pair of faux silk taffeta curtain panels in the pink vanilla color combination. They're very rich looking and family and friends compliment me I recommend to everyone.. I LOVE these curtains. I hemmed and hawed over the price for quite a while since I needed (4) panels of the 108". I am so glad I finally got them. They are thick and luxurious and I love to look at them. I work a lot from home so I decided to make my home office a pretty, glamorous, feminine room. These are the perfect touch. The pink is definitely pink and not peach but it's more of a soft pink not like a hot pink. I just can't say enough about these. No buyers remorse at all. Get 'em! I was very hesitant to buy these because of the high price tag but decided to splurge on them for my daughter's room. Wow! I was not disappointed! They are luxurious, high quality curtains! They are pretty heavy though so make sure your curtain rod is anchored or installed on a stud. Would definitely buy again! I couldn't believe the excellent quality of these curtain panels. The stitching was perfect, no seconds. The several ways provided to hang the panels was just brilliant. The flannel inner lining and the outer lining along with the front made these panels thick and top quality. I was pleasantly surprised. You'll not find this kind of quality or length in any stores. THANK YOU! Aloha. 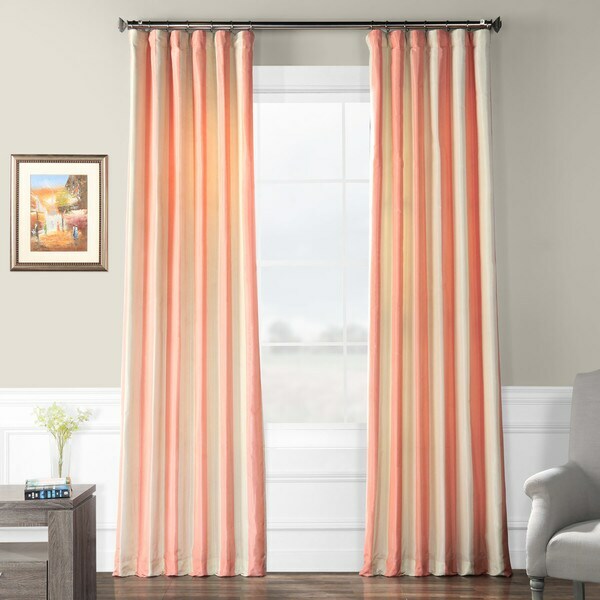 These curtains are extremely well made and a great deal for the price. They are thick, lined, subtle shimmer/silk-like effect - they just look expensive!! Do not expect them to be blackout, but they are lined and do a pretty good job keeping out light. However, note the color is not a true pink. It is more peachy-pink and cream/off-white. I unfortunately had to return them because of the color not being a true pink to match the rest of the nursery. I have bought so many panels of this pink and white stripe curtain that it's in several rooms in my house. I love them and they are so beautiful and easy care. I doubt anyone would be disappointed in them. They are simply beautiful! Purchased for my daughters bedroom and they look so expensive and well made. Very heavy fabric with lining , good for warmth in winter and cooling in the summer. Very good quality unlike cheap kids curtains. Very happy with the purchase. Extremely well made drapery panels! Wonderful product with a high end feel and look. You won't be disappionted! Don't let the product description Lt. Peach scare you, these drapes are a beautiful pink and white. The interlining adds weight and makes them hang like much more expensive custom made drapes, the overall look is very high end. Highly recommended. These curtains are now in my daughter's bedroom. The cream is as shown, light cream...I'm purchasing sheers that are "natural" or cream in color .. White looks too stark . I'm so thrilled with these curtains.. They look like custom draperies! One panel came with a little flaw. The others were perfect. Lovely silk. The pink is hard to match. Buy these first before painting. The quality is excellent. Creme not white. Looks dirty with white wall. Beautiful draperies. I normally have draperies made, but decided to take a chance on premade panels. These are gorgeous and make a big statement in my little girl's room. I had the room painted "resounding rose" from Sherwin Williams and hung them close to the ceiling for more drama. So perfect! These are such fantastic curtains. They hang in my daughter's room. They are very good quality. It's a beautiful pink. Would look nice in a baby nursery. Beautiful lined drapes with pretty texture. It took a long time to iron all the Taffeta panels for my dining room. I love the curtains but I wish I would have bought ones with grommets instead. These curtains are high quality , heavy and quite good looking. I use them in my daughter room and they block light and noise quite good on top of looking really beautiful. I would recommend! Pretty curtains. Quality very nice and rich. Has a beautiful slight shine to it and the lining is very nice too. Needed to be steam ironed once out of the packaging. I used it in my study and will now use it in my new daughter's room. Such a versatile feminine color. You can't go wrong with this brand. I only buy their curtains. "How wide are the stripes one these curtains? " They are approximately 4 inches wide. "Do you know when these will be available in a longer length?" "Does this curtain come in other colors? Blue?" This item comes in several color options; the blue one can be found under item #15682719. Additionally, If you input "Exclusive Fabrics curtains" into the search bar on our website, it will pull up all the color options available. "Can you run a rod through the curtain itself or does this only work with rings?" Yes, a rod can be used to hang our panels. The diameter of the pole pocket is 3". "the window I would be using these on overlooks a street. is the lining thick enough to provide privacy? thx"
The curtains are lined and should provide privacy. Yes, absolutely! The lining is pretty thick and the pink and cream fabric is beautiful. The quality of the fabric is nice. hi, are 2 in the package or just one? "Are these panels lined at all?" The unique sheen of the faux silk is backed by a cotton lining with flannel interlining to help energy loss through the window and block out UV rays.